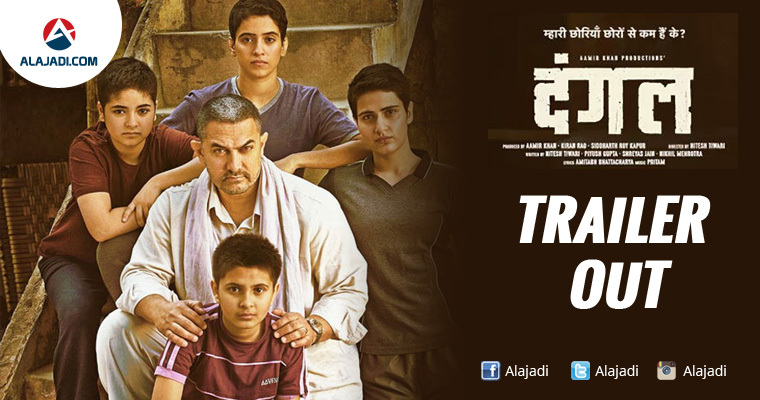 The much awaited trailer of Aamir Khan’s Dangal has finally been released. Aamir Khan manages to surprise us once again with his acting acumen and complete transformation as Mahavir Singh Phogat. But the film really belongs to actors playing his daughters. Dangal is an extraordinary true story based on the life of Mahavir Singh and his two daughters, Geeta and Babita Phogat. The film traces the inspirational journey of a father who trains his daughters to become world class wrestlers. Aamir, who hopes that his yet-to-be-born son will win a gold medal for the country someday. When Mahavir is blessed with daughters – Geeta Phogat and Babita Kumari – he sees his dream shattering. However, not one to give up hope, he takes it upon himself to train his daughters and make them award-winning wrestlers. “Hamari chhoriyaan chhoron se kam hain ke?” questions Aamir as he shows that women are at par with men. They crash every stereotype in the book, they prove that issue is not the gender but our beliefs. The moment when Aamir’s character realises this and the play of emotions on his face is a masterclass in acting. They are hungry and committed and you can see it in their eyes. Their wrestling moves or the way they announce, “Pehelwani bahut ho gayi, ab dangal ka time hai,” wants you to stand up and applaud. With the trailer itself, we can promise you this will be as unlike Salman Khan’s Sultan as you can imagine. A women’s empowerment tale, a real-life story and tale of a man finding his metier in life — Dangal is a package we can’t wait to unwrap. Yes, one cannot deny the close similarities between Sultan and Dangal, and a cursory glance will make many shots seem identical. But the story-lines are starkly different. Sultan is the story about one man’s stint with winning and losing, as a wrestler.